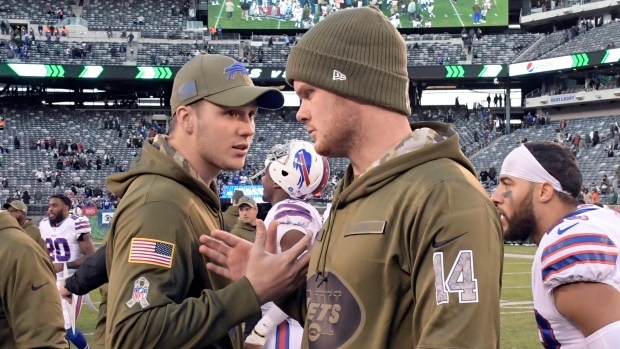 ORCHARD PARK, N.Y. — The only time rookie quarterbacks Josh Allen and Sam Darnold got on the field when the Bills faced the Jets a month ago was to shake hands following Buffalo's lopsided victory. "Trying to get him better and getting him healthy, and then we'll go from there," Bowles said, when asked if he could satisfy people's curiosity over who'll start. "I'm not really looking to making people happy." There was New York's 41-10 loss to the Bills, after which Bowles said: "We stunk it up as coaches, we stunk it up as players." Then came last weekend, when the Jets squandered a 16-0 lead in a 26-22 loss at Tennessee. Bowles referred to the collapse as "one of them games you'll remember for the rest of your life." Continuing Darnold's development then becomes the priority, much like the Bills' approach to Allen. Both have had their inconsistencies. In Week 2, Darnold became the NFL's youngest quarterback to top 300 yards passing in a 20-12 loss to Miami. On the downside, he also leads the league with 14 interceptions, including four in his last start, a 13-6 loss to Miami. Allen was erratic, going 69 of 114 for 657 yards and two touchdowns, with five interceptions and a lost fumble in his first five starts. He has shown signs of progress by going 26 of 52 for 391 yards with three TDs and two interceptions in his past two. Allen is also proving to be an adept scrambler by combining for 234 yards rushing and a touchdown in the past two games. "We're watching a young man grow and develop right in front of our eyes," Bills coach Sean McDermott said. The Jets can only hope for the same once Darnold returns. "Before he got hurt, he was developing. He was seeing the defences better. He was making his reads. He was making his audibles and checks at the line," Bowles said. "That part of it we were very pleased with. Some of those things he'll have to get back." The Jets insist they've moved on from the Bills' loss, a game they trailed 31-3 at the half, and were outgained 451 to 199 yards offence. They haven't forgotten, however. "Let's cut to the chase, man — it's personal," safety Jamal Adams said. "They came in and they whooped us, man. They don't like us. We don't like them." Bowles said the blame is on the entire offence, and not simply first-year offensive co-ordinator Jeremy Bates. "It's not from a lack of trying or everybody trying," Bowles said. "It just hasn't happened and it's extremely frustrating that we can't get a touchdown instead of field goals." After going through three starters in their first nine games, the Bills averaged 248 yards offence and 10.6 points an outing. The past three games, including Matt Barkley's one start against the Jets, the Bills are averaging 398 yards offence and 27.3 points. Allen said the improvement goes beyond statistics. "It's the feel that we have. It's the chemistry in the locker room right now," he said. The Jets tied an NFL record by going five straight without forcing a turnover. That drought ended when Trumaine Johnson returned a pass from Tennessee's Marcus Mariota 31 yards for a touchdown. By comparison, the Jets have the NFL's fourth-most giveaways (24), one fewer than Buffalo. After releasing receivers Kelvin Benjamin and Andre Holmes on Tuesday, the Bills could have as many as five starters on offence with less than two years of NFL experience. Their defence already features four players in their first or second seasons. AP Pro Football Writer Dennis Waszak Jr., in Florham Park, New Jersey, contributed to this report.